Everything he needs for a trim on the pavement is in a handmade trunk attached to the back of his pushbike: scissors, combs, electric razors and brushes. "It's a beautiful idea because it's a really old one," says the dapper 18-year-old as he makes his way through the buzzing district of Burj al-Barajneh. His real name is Mohammad Khaled Jahjah, but he prefers the name Abo Tawila -- "the Tall One" in Arabic. "People like this, and I love everything old. If I ever have the chance to open a barbershop, it'll be a vintage one," he says. 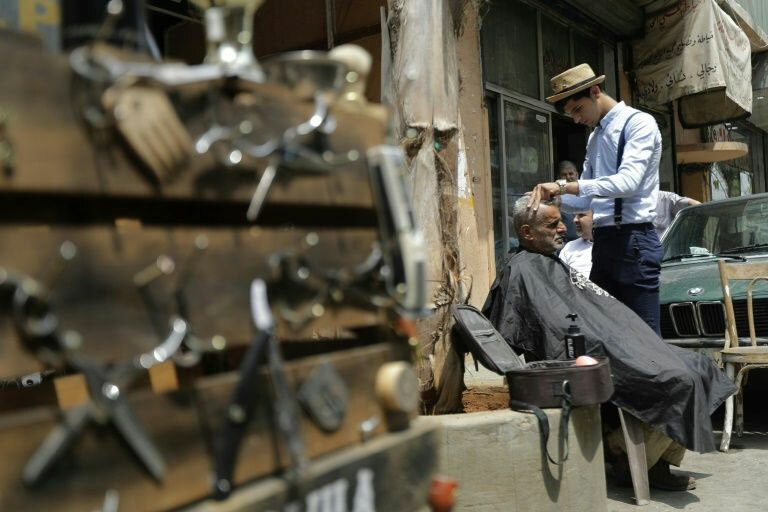 Mobile barbers were once ubiquitous in Beirut, but regular salons have since become more popular. Abo Tawila works in both, spending most of his day in a barbershop before hitting the tarmac on his bike. Some stop him for a haircut, but others hail him down to catch up or introduce themselves. "I used to love watching the barber near my parent's house. I'd come back from school, drop off my backpack, and go to his shop," Abo Tawila says. "He told me to come to the salon after school if I like this job. But I decided to leave school altogether to work with him. He taught me the trade and introduced people to me." The handsome hairdresser has become something of a celebrity in southern Beirut. He is slender, stylishly dressed, and has a sharp wit. "I'm so happy he's here," says Abo Saeed, one of his favourite curbside customers. "He's talented and always available. When I have some time, I call him and he comes immediately, so I never have to leave work to go to the barber," he tells AFP. "On top of all of that, he reminds us of the barbers of the old days." Abo Tawila wakes up at 9:00am every day, puts together an outfit and goes down to the coffee shop near his house before beginning his day at the salon. In his free time or when his shift is done, he heads out on his bike to find customers, grooming between five and 30 people a day. "The situation changes depending on the day," he says. "There's not much work now during Ramadan, because people are waiting for Eid", the feast which marks the end of the Islamic fasting month and triggers a flurry of trade. "Before Eid, we have three days where we don't sleep from all the customers coming in," he says. While he dreams of opening his own shop, Abo Tawila insists he'll stay loyal to his bike. "If I open a salon, I'll still keep it, because that's what got me here," he says.